It doesn’t take much for Judi Dench to be able to sell a movie. The highly-respected 79-year-old British Dame has headlined a handful of well-received independent films in recent years, such as “The Best Exotic Marigold Hotel” and “Notes on a Scandal,” and has appeared in the last seven James Bond films as supervisory agent M. Teaming with director Stephen Frears, who won Oscar voters over with “The Queen,” to tell a real-life story about a woman searching for the son she was forced to give up for adoption fifty years earlier, is a recipe for a crowd-pleasing success. Dench is usually soft-spoken but more than capable of standing her ground, in some cases more determinedly and forcefully than others. Here, she portrays Philomena, a mild-mannered woman who marks the fiftieth birthday of the son she gave birth to at a convent by vowing to track him down. She couldn’t be sweeter, always intent on thanking everyone around her for brightening her life and even looking kindly on those who don’t treat her very nicely. Her daughter enlists the help of a disgraced journalist, Martin Sixsmith (Steve Coogan), whose doesn’t share the same forgiving affinity for those around him, but whose interest in getting his career on track makes him a great ally for Philomena for her search. 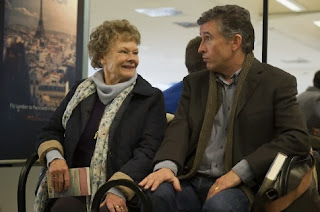 The search that Philomena and Martin begin is highly comedic in nature, full of funny moments brought on by Philomena’s small-town nature and the amazement she expresses at every innovation, contrasted by Martin’s less adventurous and positive attitude. The film doesn’t feel quite as light overall, however, due to the severity of Philomena’s situation when her teenage pregnancy results in a miserable four-year term of excessive labor at the convent which also involved watching her son being taken away from her. “Philomena” is certainly an enjoyable, affirming film with a heartwarming performance from Dench, whose character doesn’t have a mean bone in her body and whose outlook on the world deserves to be emulated. 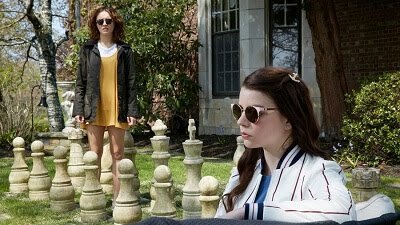 Coogan, on the other hand, adds little in a relatively bland part that serves as a less than memorable follow-up to his superb turn in “The Look of Love” from earlier this year. The film as a whole has a slightly strange tone, assisted in large part by the dramatic score by composter Alexandre Desplat, which doesn’t fit the buoyant feel of the film. Ultimately, the film succeeds in being charming and involving, and it’s hard not to like.